Muscles, Tissues, Enzymes, Hormones etc. :Proteins or amino acids are essential components of our cells, tissues, enzymes, hormones and every other body part. The proteins from salmon (and most other fishes) are easy digestible and easily absorbed into the body. They do neither have any adverse side effects nor contain carcinogenic compounds, like other meats do. Salmons are also source of good fat (omega-3 fatty acids) which also plays a vital role in keeping you healthy. 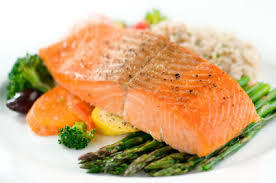 Salmon is also rich in some of the very essential minerals like iron, calcium, selenium and phosphorus and vitamins like A, B and D. Selenium, which is very necessary for building up of tissues, hair, nails etc., is best obtained from animal proteins and among which, salmon is one of the best. Cardio-Vascular Health: While the Omega-3 Fatty Acids help reduce cholesterol, maintain flexibility of arteries and veins and strengthen cardiac muscles, the essential amino acids repair damages to the cardio-vascular tissues. They help reduce the blood pressure too, as they lower cholesterol level and prevent hardening of walls of arteries and veins, thereby considerably reducing the chances of heart attack. Metabolism: The Omega-3 fatty acids, vitamin-D and selenium, together help increase influence of insulin, thereby facilitating absorption of sugar and consequent lowering of blood sugar level. Eye Care: Again, the Omega-3 fatty acids and amino acids help prevent macular degeneration, dryness, loss of vision and fatigue of eyes. It is a proven fact that people who eat fishes regularly or more than others, have better vision than others, longer. Brain & Nerves: The Omega-3 fatty acids increase efficiency of the brain, improves memory and keep it wide awake during long working hours. In company with the amino acids, vitamin-A & D and selenium, these fatty acids protect nervous system from damages from aging, act as anti depressant, relaxes the brain and are also helpful in treating Alzheimer’s and Parkinson’s disease. Perhaps that is why the fish eaters are supposed to be more intelligent than the meat eaters. Other Benefits: Omega-3 fatty acids reduce inflammation of the arteries and digestive system, reduce chances of cancer of colon, prostrate and kidneys etc., improve skin texture, add shining to eyes, skin, hair and nails and help in the growth of beneficial bacteria in the colon. The fatter the salmon, the more nutritious and healthy it is. It is a good protein supplement of older or sick people too, being easy digestible. In some parts of the world, it is cheaper than other sources of animal proteins such as meat, poultry etc.